Basement find. A Client was looking for a chair for her daughter’s nursery room. She searched stores, but to no avail could not find a chair that she liked. We had just finished upholstering a different chair for her. She informed me she was looking for a chair with a solid frame, that was comfortable and that rocked. For her daughter, that was going to have a baby. In the basement of our shop we have vintage furniture that people were either going to burn or bring to the dump. Solid wood frames, vintage lines, furniture build better then anything today. I knew of just the chair that might be perfect. I brought her to where the chair was, showed her the chair in mind. A vintage platform rocker. She took photos, sent them to her daughter. They thought it would be perfect. A few days later she brought me the fabric she wanted on the chair. I brought it up from the basement and the restoration began. We start the restoration by first stripping the platform rocker to the frame. Taking off all the old fabric, cotton padding and the burlap. Once we are down to the just the solid wood frame. We disconnect the seat springs. So we can re-glue the main structure of the chair. Making sure the platform rocker will last another 70 years. Now that the frame is re-glued. We attach new E. K. Clips ( clips that hold the springs in place.) Attach the seat springs. Then attach the back springs and replacing any E.K. clips that are broken. Re-building the chair like it was manufactured 70 years ago. The frame is almost ready to be upholstered. Before we can upholster, we sand and clean the wood, The client likes the look of the lighter wood so we just clear coat the wood with an acrylic finish so the wood is the natural color. The frame is solid, the arms and base are cleaned and finished. Now we begin to upholster. New burlap is stapled over the seat and the inside back of the chair. The seat cushion is put back on the chair. This original seat cushion is comprised of straw, horse hair and cotton. By reusing the original cushion verse buying new foam. The original cushion will not break down like the foam cushion. Most foam breaks down between 7 to 12 years. We do however add more cotton to the original cushion making it more comfortable. Then we add 1/2 inch Dacron over the cotton making it even more plush. The seat is upholstered first, Then the arms are upholstered. The inside back of the rocker in now upholstered. only thing left to upholster is the front band of the chair and the outside back. ( The front band is the front of the chair under the cushion.) We put new dacron and cotton on the front of the chair then the fabric. The outside back we apply dacron so the chair is padded and then we staple the fabric. The chair is now completely restored. Now this 70 year old platform rocker will be used and enjoyed for another 70 years. Christmas Special From November 13th thru December 25, 2018. The Furniture Specialist will be running a Christmas Special 10% OFF Labor. For All Your Furniture Repair Needs. 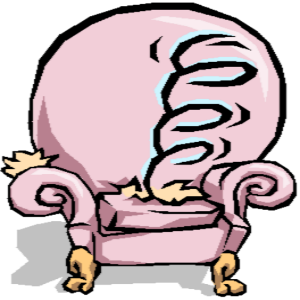 Whether it is broken springs, you need new foam cushions, broken frames ( dining room chairs, sofa, loveseat, chairs) or just want a new look before Christmas. We do it all. Call, Email or Text to schedule an appointment. No job is too large or too small. Does Your Furniture Have Cheap Plastic Spring Clips? We are finding some manufacturers are cutting corners by using cheap plastic spring clips. This article discusses the differences between spring clips. Plastic clips versus metal E.K Clips. We will also be removing the plastic clips and replacing with Metal E.K. Clips. The photo above shows a strip of plastic spring clips, on the bottom left of the picture. As you can see, some of the clips have broken off. Instead of just cutting off the section where the clips broke off and repairing just the broken ones with metal clips, we are taking off the whole strip of plastic clips. We have repaired these sofa’s in the past, and have noticed after about 7 years the plastic starts to become brittle then breaks. If we just repaired the broken ones and leaving the plastic clips that are still attached, the plastic spring clips will eventually break and we would have to replace them. So we remove all the plastic spring clips and replace them all with metal ones. When we repair our customers furniture we want it to last. We’ve noticed over the past few years, a lot of furniture manufacturers have been cutting corners in their manufacturing process, in an effort to produce their products at a lower cost. The Sofa is now repaired. Are you in need of a repair similar to this? We would love to help you out. Here is an example of a love seat with collapsed arms. Collapsed arms on chairs and couches is becoming more prevalent in the furniture business these days. A collapsed arm happens due to substandard materials being used in the manufacturing process, such as cardboard in the loveseat picture below. Have you ever wondered why? As you can see in the picture below, we pulled back the cardboard to reveal a voided space in the construction of the loveseat. The only support for the arms of the loveseat, is a piece of plywood placed vertically within the arm, with voids to the right and left of the plywood. The arms of this loveseat can only support the weight of what the cardboard can hold. Let’s talk about how we fix this type of poor design at The Furniture Specialist. First, we remove the fabric or leather carefully from the furniture. We make every effort to be able to reuse the fabric or leather that is currently there. Underneath the fabric or leather, there is foam padding and Dacron. We remove the padding and Dacron to expose the cardboard. We lift the cardboard up from the arm of the chair, then place foam in the voids of the arm assembly. We reattach the cardboard, then reassemble the Dacron and foam padding. If the Dacron is worn out or torn, the Dacron is replaced. At the end, we put the fabric or leather back in place, and we’ve finished the project. The time it takes to make a repair of this nature can range from 2-3 hours, and our customers are much happier to continue having the furniture they currently love, rather than having to replace the furniture piece in their homes. Do you have an armchair, loveseat, or couch needing this type of repair? We would love the opportunity to help you with a project of this type. Give us a call, and we schedule an appointment to pick your furniture up.